Talk about interesting food names. You have heard these making you wonder why they are called so. Whoopie pies - a cross between a cake and a cookie - apparently leftover cake batter was used to make cakes (which were then baked in pie tins) and when they were baked farmers would exclaim 'whoopie! pies! Our own Gudbud Ice cream and a score other names of ice creams, some of which send the blood rushing to your face as you order. Strozzapreti pasta which literally translates to 'strangle the priest' (can gastronomic pleasure be this violent??!!) Monkey bread - thankfully no real monkey in here - a very delicious bread you can monkey around with and still not mess it up - I am going to be trying this soon ! The cocktail Bloody Mary. Queen of Sheba Cake. Imambayildi - a Turkish dish of eggplant which which means the priest fainted. Apparently the priest ate this dish and fainted, as it tasted so heavenly! Now, I wouldn't probably risk fainting if I ate something that good - I would try to be very much conscious - to hog on the dish and then blog about it! Another interesting name here - Duchess Potatoes - The name's bound to get your attention the first it catches your eye. 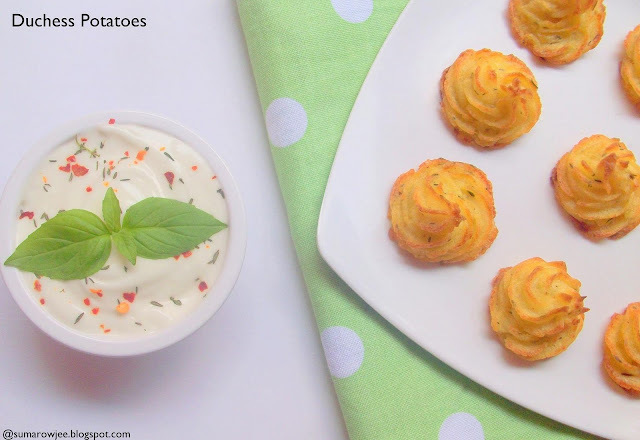 This is boiled potatoes mashed and mixed with butter, seasoning and herbs, sometimes cheese, spooned into a piping bag and baked till golden & crispy on the outside and creamy inside. Now it would be an effort to not like it right? Now why are Duchess potatoes called so? After eating these delectable little things, I think these are called so as the humble potatoes are elevated to the status of a Duchess - the makeover an easy, simple, but remarkably sensational one. I remember watching Chef Sanjeev Kapoor baking a similar dish with mashed potatoes and cream . Looked really good and of course it can't not taste good as it has ingredients which can't really fail to please. 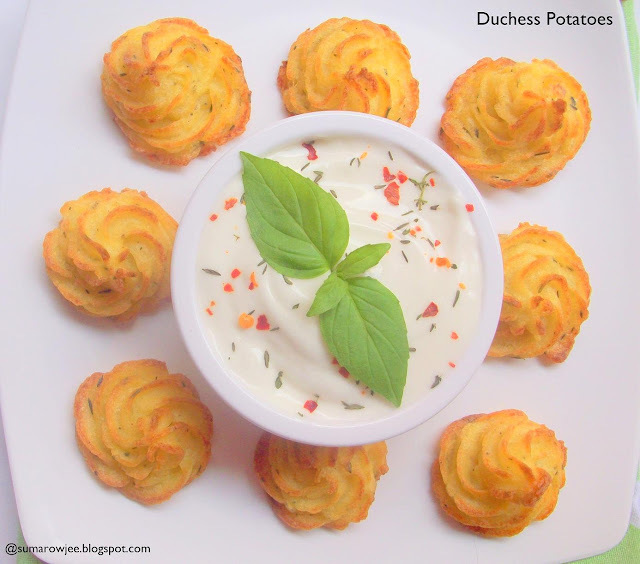 I Googled for this recipe, and Duchess potatoes popped up tantalizingly on my screen. Finally took me to Nicole's Baking Bites. And I had to try these stat! As Nicole says, Duchess potatoes make a great accompaniment to any meal, will surely grab attention when you serve and leave your guests wanting more. You can add spices and herbs of your choice, cheese if feeling more indulgent and impress people with these elegant, pretty and delicious little things. So the next time you have a party, chuck the boring and predictable starters and try Duchess Potatoes - and you will become a fav hostess! I started with the intention of halving Nicole's recipe and eventually ended up making 3/4 of it as I felt 1/2 would be a little less. Have to bake, taste and still have enough left for the pictures. 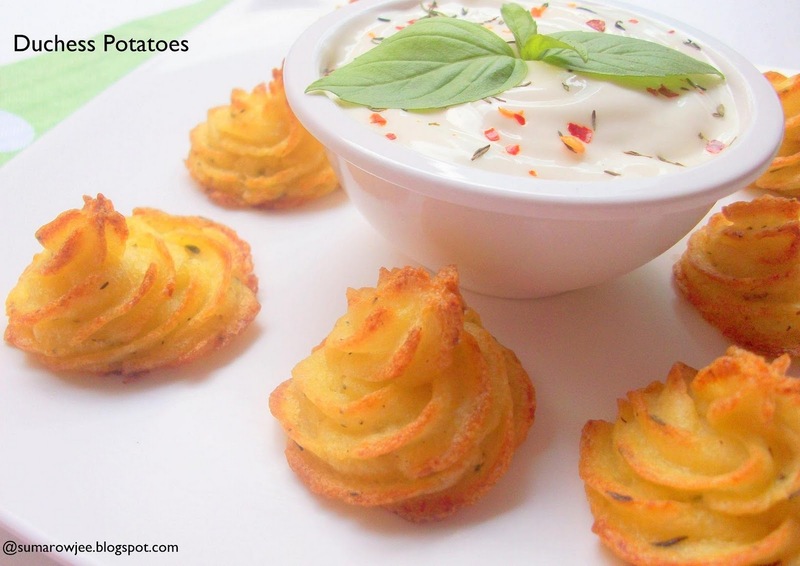 You could make these with left over boiled potatoes (this happens quite often), but you would need to warm the potatoes before you add the rest of the ingredients. I would not add too much or too strong by way of flavorings, as the subtle flavor of the butter and herbs would then be lost. They taste great as is and if you have to serve them with a dip , I would keep it to a subtle creamy dip such as mayonnaise, sauce would drown the subtle flavors again. You can find the recipe on Baking Bites here .Here is what I did. Dried thyme - 1 teaspoon or to taste. If using fresh, you would need to use more. Procedure :Preheat oven to 190 degrees C / 375 degree F. (Nicole bakes at 200 degrees C/ 400F for a shorter period). Line a baking sheet with parchment paper. Peel and quarter potatoes and pressure cook for one whistle. Do not over cook .Alternatively, place them in a large pot of boiling water and cook until fork tender (time will vary by size of the potatoes). Drain and put them back in the cooker (no lid of course) on low heat for a couple of minutes to dry out any excessive moisture. Add butter and seasonings and mash potatoes well. I used a flat wooden masher for this. The point is to mash them really well without any lumps. Allow mixture to cool for 10-15 minutes, until potatoes are not hot to the touch, then mash in the egg until potatoes are smooth. The mixture will be quite firm. Adjusting seasoning and still mixing it in uniformly will be a little difficult due to this consistency. Transfer mixture to a piping bag fitted with a large star tip. Pipe potatoes onto baking sheet to form swirling peaks, about 2-inches across, but mine were shorter and not as gorgeous as Nicole's. Brush really gently with additional melted butter. A silicon brush is good here again. I tried using oil spray from the can, but the pressure was a bit too much for the dainty Duchess, some of them drooped! So be careful if attempting this. Bake for 25-30 minutes, or until golden brown. Serve hot straight from the oven. Making ahead : If you want make prior preparation for this, boil the potatoes and refrigerate. Warm them in the microwave and carry on with the rest of the procedure. I refrigerated some of the mixture for hubby (with everything added) it firmed up a lot in the fridge, making it difficult to pipe out. I warmed the mixture in the microwave and piped again, the swirls were not as stiff and drooped as they baked, but delicious still. So you could very safely try these out and you will love them whatever shape they take. The above quantity will be enough for 6 people to eat delicately, 4 if you want to be ahem... greedy. Now I won't tell you which of these we did between me, hubby and the kids, a tiny bit sneaked out for my neighbor. Have you baked these and has something worked really well for you? I would like to know as I very very certainly am going to be baking these again. Care to share any interesting or amusing food names? 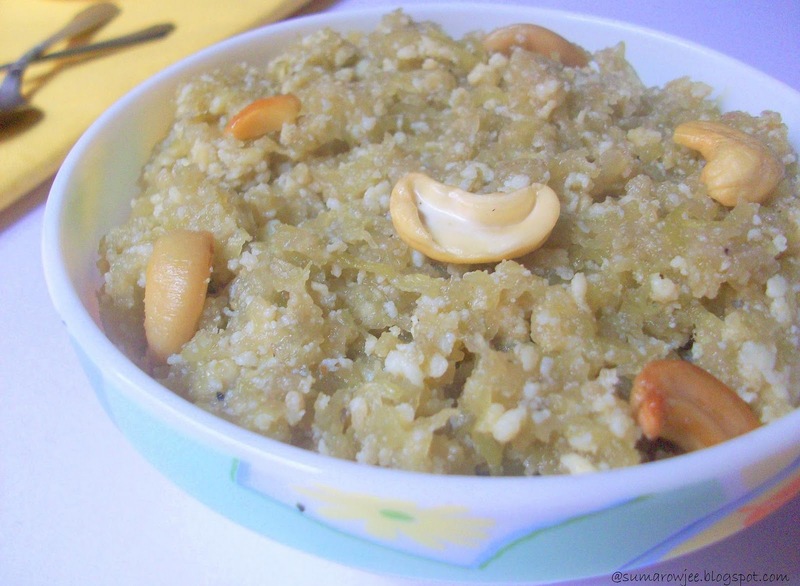 Bottle Gourd Halwa - Ugly, But Deliciously Low Fat! Familiar with things that don't deserve a second glance but you discover are actually truly good? Things we decide are definitely difficult even before we give it a try? People who don't make it to your most loved people list even before you get to know them? Places you dislike even before you visit? (hot, humid places in my case). Cuisine you don't care to try as it doesn't sound appealing? (Am really really unadventurous here, yeah, boring simply put). Fruits and vegetables you don't care to even buy before you know what it tastes like? And then there are surprises - the ugliness turns out to be insignificant. You take to that 'difficult' thing like a fish takes to water. Those 'ho-hum' people go on to be your best buddies. That boring cuisine or dish becomes your default order (you won't believe, strangely I disliked Gopi Manjuri, oops, Gobhi Manchurian when I first ate it). 'That' vegetable which sends your eye-brow to your hairline becomes a favorite and you start recommending it to anyone who cares to listen. Like bottle gourd in my case. Though I take pride in eating almost all common vegetables (sea weed and the kind don't classify here I guess, no, I believe - firmly!) bottle gourd has somehow not made it to my veggie bag. No, I have nothing against the poor vegetable, my Mom never did cook it extensively (kiddos, now you see why I play Dictaress when I buy vegetables), hubby never noticed that I haven't cooked this veggie in all the dozen years of marriage (well, he hasn't even noticed that I have not cooked banana blossom and banana stem either, am too lazy for that and he is a non-fussy-eater). Well, to cut it short, if this veggie graces the rows of a vegetable stall, I just don't see it. Its like it just does not exist - simple! I have always considered bottle gourd as a vegetable to be eaten (or not cared to be eaten ) as a vegetable, not as dessert. Till I decided to give making Bottle Gourd Halwa a try. This is a fairly common dessert in northern parts of India, whereas the more common avatar hereabouts is with carrots and pumpkin. 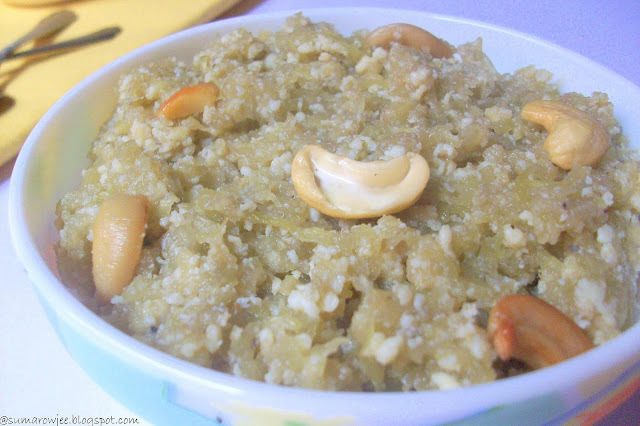 I made the halwa a low fat one, with low fat khoya, very little ghee - and absolutely loved it! Its easy, its quick and delicious. And healthy too! If you have been shying away from this vegetable or looking for a quick and healthy dessert, you must try this. Don't go by the dreary look of the halwa, agreed it really does not look like the most inviting dessert on earth. But tastes great without any doubt. It may not be a gourmet class dessert, but nevertheless a very tasty one and a low fat one at that, so this has to be on my blog. As if the halwa being not-pretty is not bad enough, it had to be really really cloudy the last 2 times I made it, adding to my infamous bad pictures. 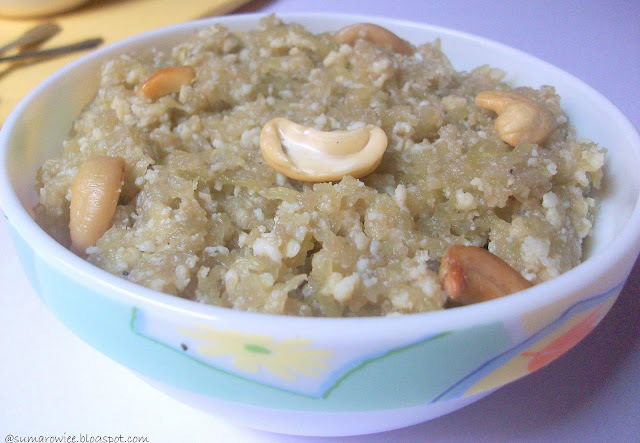 Hoping you won't let the dreary look of the halwa lead you away and you will still give it a try, let me tell you how I made it. Green food coloring - Optional, did not help really! Dunno if any other color works better. Rub the saffron strands in 1 tablespoon warm milk. Set aside. Heat 2 teaspoons ghee in a pressure pan. On low heat, saute the cashew nuts till a light golden brown. Remove, reserve. Add the grated bottle gourd, saute on low heat for a couple of minutes. In goes the milk. Pressure cook for 2 whistles. Turn off. Once the pressure is released, add the sugar. Gleefully tip in the low fat khoya. All of the 1 1/4 cup, don't hold back! Cook for about 5 -10 minutes, till the sugar dissolves completely and the halwa comes together. If there is any milk left in the pan, cook on low heat till it evaporates. Mix in the saffron, cardamom powder, a tablespoon of ghee (or more). Mix in food coloring if using, but go easy, too much may make it taste funny and look even scary! Turn off the heat. Garnish with the nuts. Serve warm or at room temperature. And don't bother with very modest servings! I had sent some of this halwa to my reed slim, health conscious, sweet-toothed neighbor and she messaged me later saying she loved it. 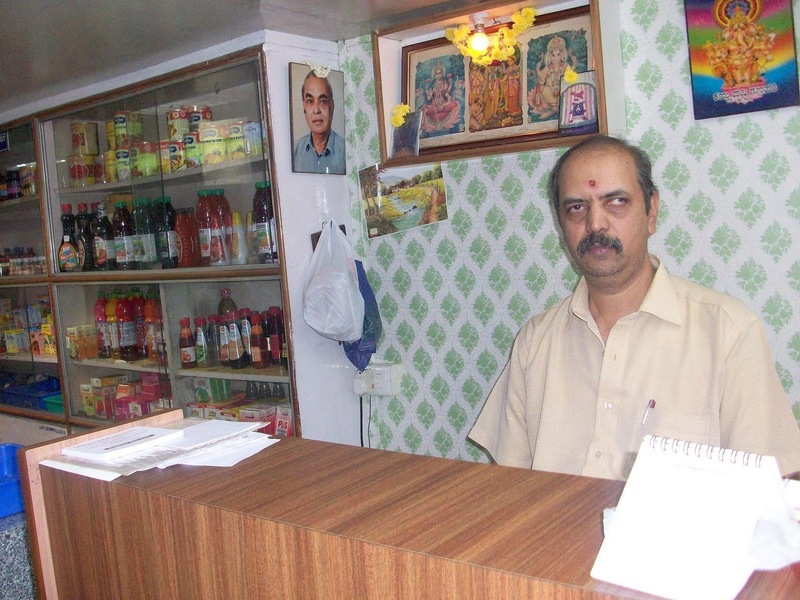 I messaged back, ' no guilt, low fat and very little ghee'. Her surprised 'Oh! But its SO tasty!' made me so happy! A note on the low fat khoya : This tastes pretty tasteless on its own (unlike regular khoya), so don't judge on this basis. But when mixed with the rest of the ingredients, the taste and texture is almost identical to the normal khoya, sans the in-the-face-richness. Please don't take my word for this, try it out yourself and let me know how you liked it.. Here are other desserts I have tried with low fat khoya. Today is World Bread Day! For those of us who are new to this, October 16th was declared as the World Bread Day by the International Union of Bakers and Bakers-Confectioners (IUB) a few years ago. Zorra at Kochtopf hosts this day as an event on food blogs, this being the 6th edition. She invites bloggers to participate in this event, by baking a bread and posting it on their blogs on 16th October. This day also is World Food day and in Zorra's words, 'Is a day that should heighten our awareness of the world food problem and strengthen solidarity in the struggle against hunger, malnutrition and poverty. Of course we can not solve this problem by baking a bread, but perhaps some of us will share their baked bread with someone who is not as lucky as we are.'' As a new bread baker, I am very happy and proud to be participating in this event. Here comes my attempt at baking brioche for World Bread Day! 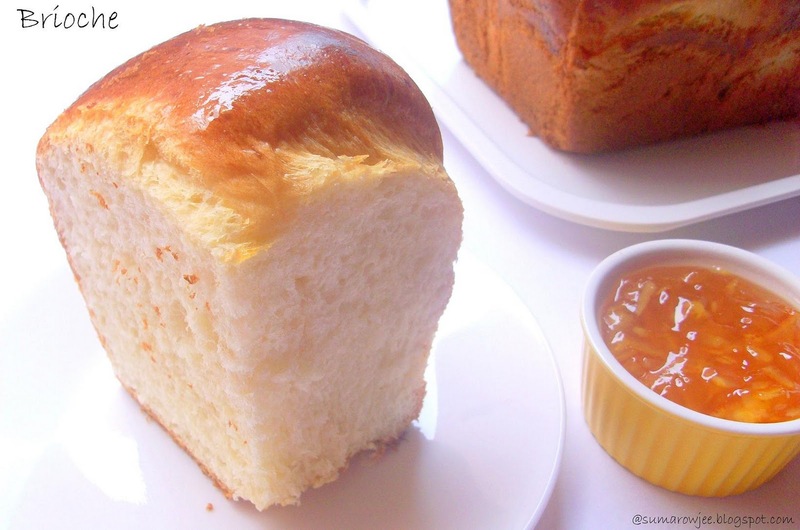 Brioche is a very rich French bread which is baked with eggs and butter. It has a very tender crumb and a flaky crust and is often characterized by its deep golden crust which is the result of the amount of sugar in the dough, an egg wash adding to the deep color. 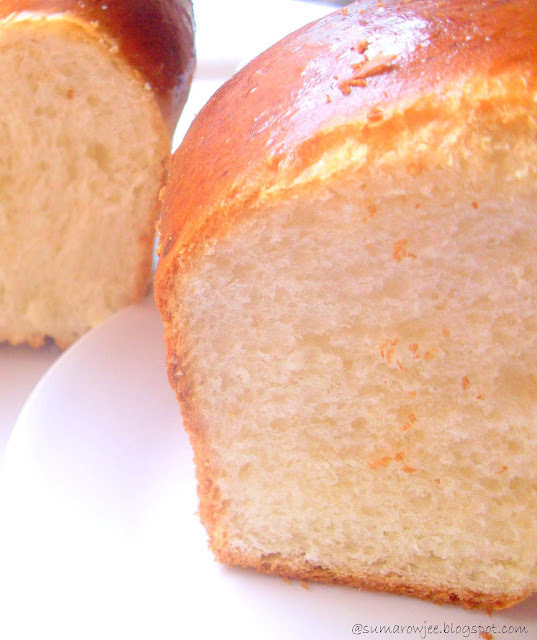 Brioche has quite a high fat ratio of flour to fat as much as 3:1. The classic form of brioche called the Brioche à tête or parisienne is a big round ball of dough formed and placed in a fluted flared tin ( think a tart mold) with a smaller ball of dough placed on top of it. This is also baked in individual smaller molds and also baked as a loaf - a Brioche Nanterre. Source Wikipedia. 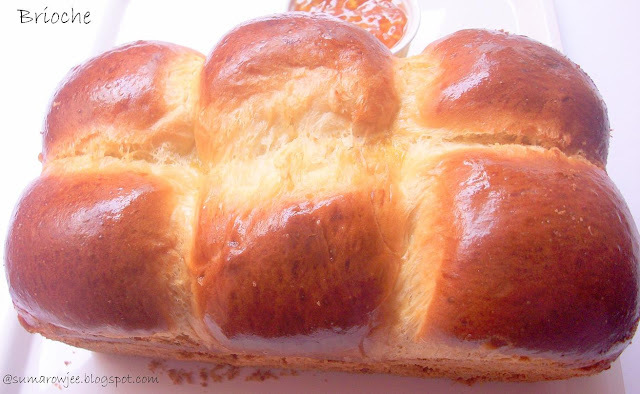 Other forms of brioche are buns and braids. Before I tell you any more, I have tried baking brioche earlier and it did not make it to the blog as it developed a huge split (which did not look rustic or any such appealing thing) as it baked, and I probably generously contributed other variables to the not-successful bread. Nevertheless it was an otherwise good loaf and I made a Nutella Brioche Pudding out of it. A very very frequent visitor to the talented Champa's Versatile Kitchen this bread has been on my to-try wish list among a lot lot more breads on her blog. If you have not yet checked her space, you absolutely must! Her repertoire of breads and other bakes among other things will surely inspire you to bake! 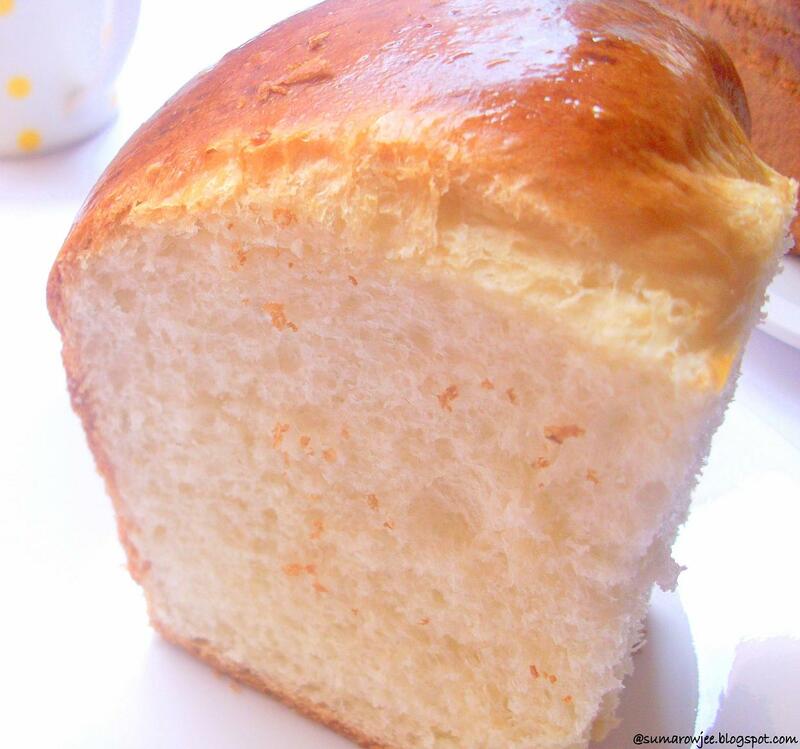 This brioche is a recipe she has adapted from 'Bread Machine Baking' by Lora Brody and Millie Apter and Champa has made it a reduced fat, egg less version. I have made it with eggs and added a splash of vanilla, while the rest of the recipe remains the same. I have played safe this time around and stuck to Champa's original recipe except for the eggs in place of the silken tofu puree she has used. The brioche rose beautifully as it baked, had a golden dark crust, sliced so well, was soft and tasty to eat as is fresh out of the oven. I have shaped the brioche as she has done, with 6 buns placed side by side in my 9*5 loaf tin. I must confess the bread did not look glamorous as the balls of dough did not grow into each other smoothly and were looking kind of pulled apart. I was again in a dilemma, but could not resist posting this as it turned out so good, everything in place except for absence of the smooth coming together of the buns to form a loaf. Hopefully this should classify as a fairly decent attempt. You tell me! Method: Mix together the flour, gluten and salt very well. Keep aside. Whisk the eggs lightly (just enough, no need to whip up a volume), add the vanilla . Set aside. Mix in yeast with warm water and sugar. Add melted butter and egg mixture. Slowly add flour and make the dough. The dough must be soft and silky, but not sticky. Take care not to add too much flour here as the bread will be dry. It really helps to use a bread machine or a stand mixer here. I have gradually added 2 tablespoons of flour here to get the dough to this consistency. Knead the dough for 10 minutes and place in a well oiled bowl, turn the dough once and cover it with a clean towel. Let it rise till double in volume. This took 45 minutes. This time may vary. Deflate the dough. Make 8 balls out of the dough and place them side by side in very well greased 9'' X 5'' loaf pan. Cover with a greased aluminum foil and let it rest in a warm place for an hour or till doubled. This again took about 50 minutes. Towards the end of the rise time, preheat the oven to 190 degrees C / 375 F. Just before placing the pan in the oven, brush the top with the the whisked egg. A silicon brush works really well here. Place it in the oven and bake for 20 minutes. Stick around and watch how beautifully it rises! It was already a very good golden brown after 15 minutes. Remove from the oven and tent with aluminum foil to prevent too much browning. The aluminum foil I had placed kept continuously slipping off the loaf as it touched the walls of the microwave and I had to open the door and set it right a couple of times. Reduce the temperature to 180 degrees C / 350 F and bake for another 15 - 20 minutes. I baked for 15 minutes, the temperature on the instant read thermometer read 202 F. In case you don't have an instant read thermometer it should sound hollow when tapped and should have a beautiful golden brown crust. Remove from the oven and brush the top with butter. Remove to wire rack after 5 minutes and let it cool completely before slicing. I had a tough time getting the loaf out from the tin. The egg-wash had dripped down to the bottom and also helped glue the loaf to the sides of the well greased non-stick pan as well. Flour : Champa uses 2 2/3 cup of bread flour. One cup of bread flour is one cup APF plus 1 tablespoon vital wheat gluten. I have used 328 grams grams of APF plus 25 grams of vital wheat gluten to make the bread flour. One cup of APF measured by scoop flour into the cup and level method weighs 130 grams. I have weighed 2 2/3 cups taken out 2 tablespoons plus 2 teaspoons flour and replaced it with 2 tablespoons plus 2 teaspoons of gluten. Whew! Eggs: The recipe specifies 2 extra large eggs, one large egg weighs 48 grams without shell. I have approximately taken 120 grams of egg (without shell) as 2 extra large eggs. Maybe this was a bit more, so I had to add 2 tbsp flour extra. I think 2 eggs should work. Do tell me what worked for you! Champa has used 1/2 cup plus one tablespoon pureed silken tofu in place of the eggs. She has used a mixture of 1 tsp milk and 1 tsp olive oil in place of the egg wash for brushing before baking. The bread was soft and just about sweet. I had thought that it would be sweet with 6 tablespoons sugar, but it wasn't. I guess its because it makes such a huge loaf! I sliced, took the pictures (in very low day light, thanks to the cloudy weather here in Bangalore), stood near the kitchen counter and ate 2 slices with some orange marmalade. Yumm! ( I normally don't like eating bread without toasting). My son thinks its a better idea for me to bake brioche instead of regular bread everyday! Champa says brioche makes great croutons, I must try that next time I bake this. This is another keeper of a recipe from you Champa, thanks so much! Needless to say, the brioche goes to Zorra's 6th edition of World Bread Day . Thank you Zorra, you make me feel proud of being a home bread-baker! DISCLAIMER:*This post contains affiliate links. This means if you click on the link and buy through the link, I will earn a tiny commission on the same. 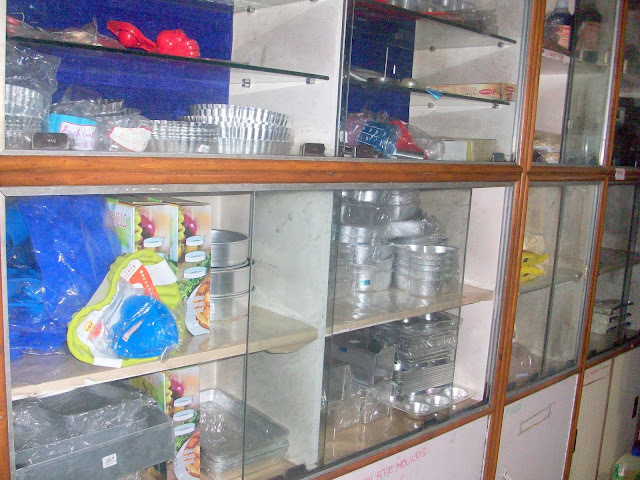 I recommend products which I have used and found good or products I would consider for myself based on recommendations from my trusted baker friends. There will not be any extra cost to you. This commission will help me with me costs of running the channel and bring out more videos for you. Your support will be greatly appreciated. 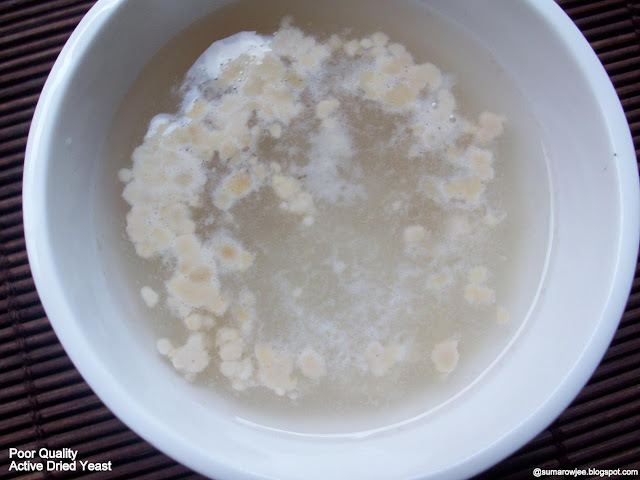 Types of Yeast, How To Proof Yeast . How to check if is active and good. Watch my video! Please follow my page on Facebook for updates on new videos for beginners in baking, every Monday! Click here to subscribe to my You Tube Channel. Click to subscribe now! My baking life was fairly peaceful with cakes and some simple desserts till the Yeast Beast stepped in and caused utter chaos. I suddenly got it into my head that I must bake bread. And this little voice in my head was hard to silence. So I set out to bake bread with the active dried yeast we get in our friendly neighborhood super-market. Warm water, sugar and in goes the yeast. Nail biting 10 minutes, froth here and there and I guess that's good enough! I mixed the dough and waited for it to rise, waited and waited, no rise sometimes, not enough rise at other times. Bricks of bread as dense as the forests of Amazon. Grumpy me. Baking bread on a weekend was torture for my family. The dough just would not rise enough (and this had to happen twice) and I would refuse to go out without finishing the bread baking business. Hair-tearing time for me and my family. Obsessed, perplexed me.Improper proofing perhaps? Water too warm (no thermometer then) ? Lets start again, with water less warm. No different results. Aaahhh! Yeast in the pack is over, I rush to get another pack. (you are now convinced that I am mad) Wrong recipe for a beginner? This is crazy! Bread baking is just not my thing, I must give up and stick to cakes and the like. Optimistic me went ahead and baked a couple of loaves, thank fully better ones. May be the yeast was better in this pack and I chose the right recipe too. Joy!! But then, it was short lived, as I was getting inconsistent results. Then I got a packet of yeast which read as instant yeast and more importantly a 'phoren' make. Hope! Looked so different, let me try! Consultation with Champa and I bake again. Good rise, every time, better breads. Aha! Finally nailed the major culprit factor - the yeast! Slow, but a momentous realization for me! Good yeast, as we know is the first most important thing for a good bread. If the yeast is not good, even if everything else is perfect, the bread won't be good. So its important that we know yeast and how to identify it its good. This done, you have won half the battle. But if you live in the US or elsewhere, this is not relevant to you as you have access to only good yeast and you probably can't even think of (bad) yeast as a factor for a failed bread. 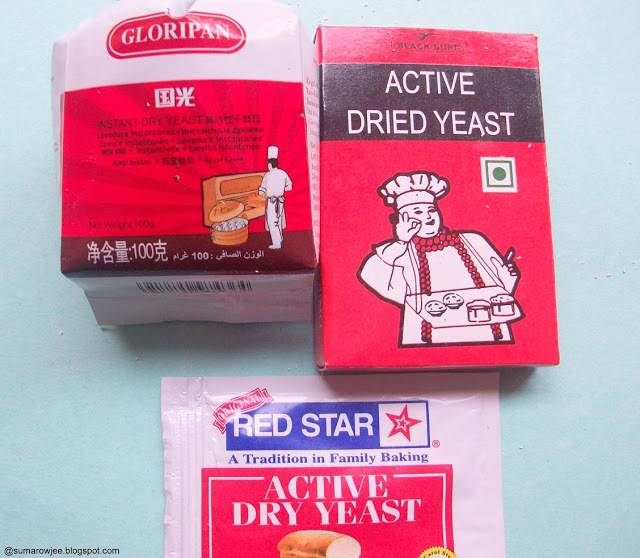 For us folks here in India, good yeast is a real find and a rarity. Its imperative we know how to distinguish the hero from the villain. I have baked bread with bad yeast quite a few times not knowing that the yeast was not good enough (dense me, huh?) to even bother with. 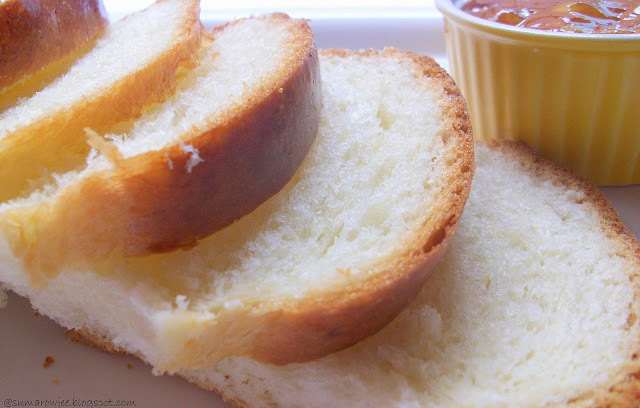 If you have not baked bread yet or been struggling with bad yeast, this post may be of help. The below information has been compiled with reference to Champa's blog, Baking 911 and The King Arthur Whole Grain Baking Book. Varieties of yeast: First things first. We have 3 types of yeast, Active Dried yeast, Instant Dried yeast and fresh yeast. Active Dried Yeast : Is fresh yeast which has been compressed and dried until the moisture content is highly reduced. 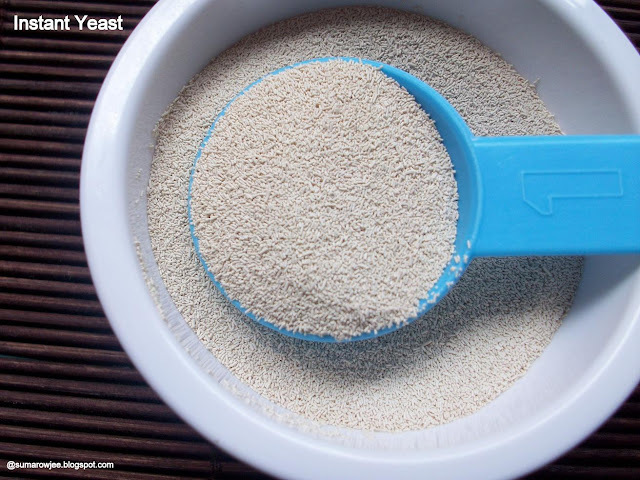 This yeast is available in the form of large granules in India, examples are Eagle, Kwality and a lot of other brands we see in our super-markets here. This kind of yeast needs to be dissolved in warm water and sugar for the yeast to be active again, this is called as proofing. Proofing is a test done to make sure the yeast is still active and good. If the yeast, fails this test, please discard and get yourself some good yeast. My experience has been really bad with these brands we get here as even the ones manufactured a couple of months earlier don't proof. It has worked once or twice for me, but not very reliable. So not worth trying out at all in my opinion. The one I got from the US (these are smaller granules) work fine. Instant Yeast: This yeast, a relatively new thing, comes in tiny granules. I had been struggling with Active Dried yeast we get here and then got instant yeast. It looked almost like powder to me since the granules are really tiny. The way it looks when it proofs also a little different as compared to Active dried yeast. This yeast does not need to be proofed and can be added directly to the flour, liquid and rest of the ingredients of a bread recipe. However, it does not hurt to proof this yeast. This yeast also has a long shelf life. This yeast works even if you use cool or ice cold water and no sugar, but of course the time it will take to rise and develop will be much much longer. As in this recipe and Peter Reinhart's famous pizza crust. As instant yeast does not need the kick-start with warm water and sugar to become active, this one is a safer bet when you are just starting. Because even if you err with the water being less warm, the yeast will still work, albeit a little slower than what is mentioned in your recipe. As long as you don't kill the yeast with water too hot! And when you bake bread, you can just add all the ingredients together and mix the dough. I love using this yeast. 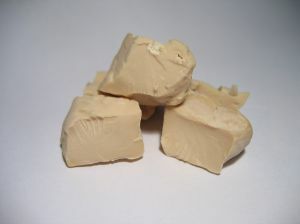 Fresh yeast: Also called as cake yeast or compressed yeast or bakers yeast. Comes in small squares, is soft and moist and crumbles easily, stored in the refrigerator. This yeast has a short life of 2 weeks in the refrigerator and needs to be proofed before using. If frozen, you need to thaw the yeast in the fridge before proofing. Some of our local bakeries use this yeast. I have never seen or used fresh yeast. Supposedly quite potent and best used in breads needing long rises. 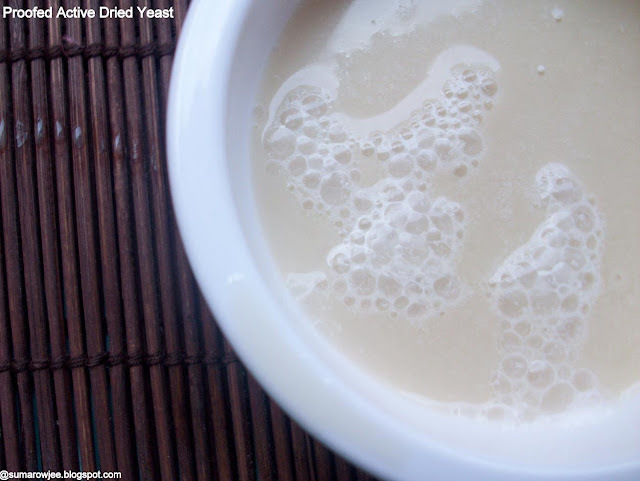 Choosing your yeast : Take a good brand of yeast, preferably instant or Active Dried. I prefer instant yeast and am very partial to a brand called Gloripan. To repeat and bore you, do not bother with our local brands of Active Dried yeast. And be wary of repacked instant yeast if you are buying from an unknown or new source. Sources listed below. Proofing: The test to determine if the yeast is good and active. If using a brand of yeast for the first time and you have never baked bread before, even before you gather all your ingredients and get ready to bake - proof the yeast. Take 1 tablespoon sugar in a bowl. Sprinkle 2 teaspoons of yeast over it. Add some warm water say about 1/4 cup . The temperature of the water must be around 110F for active dried yeast. If the water is too warm or hot, it will kill the yeast. The water must feel like tepid bath water and feel comfortable on your wrist. If the yeast is good, it will start to foam and you can see bubbles over the surface. This starts to happen in about 2-3 minutes if the yeast is really good. This must happen within 10 minutes. If it does, you have found your 'good' yeast. Treasure it and spread the word! If it takes longer to foam, its not good enough - discard. A bubble or some froth here and there or too little froth are no good. If using instant yeast, the bubbles will be really small, almost like whitish kind of froth. With Active dry yeast with larger granules, the bubbles will be bigger. And the yeast is going to just foam and not froth 'wildly'. The below picture is instant yeast proofed. Its foamy. This is active dried yeast proofed, if the granules are big, you will see the foam as well as some large bubbles. This is poor quality which has not proofed its worth!! You can see foam here and there and this does not work well. From my experience!! Please note: If proofing fresh yeast, the temperature of the water must be a tepid 100F as mentioned in The Cake Bible. This apparently has to be proofed without contact with sugar or salt. I have not tried this yet. After you proof : Once you have found your brand of good yeast, you are all set to bake bread. Keep all your ingredients ready before you proof the yeast. You should add the rest of the dough ingredients preferably within 10 minutes of proofing the yeast. If you proof, find it good, leave it aside for a good 20 minutes and then proceed, the yeast will have lost its potency. So don't hunt for ingredients after you proof the yeast. Mise en place really pays! Storing yeast: Store an opened pack in the refrigerator or chill tray of your fridge. If you buy one of those 500 gram packs, transfer some of it you could use with a month or two to an airtight box, keep this in the fridge. The rest can be stored airtight in the freezer. I have stored for about 4 months in the freezer. Unopened packs store longer. But do remember, perfectly good yeast will not work well if not stored properly. One envelope of yeast : Is equal to 2 1/4 teaspoons of yeast. 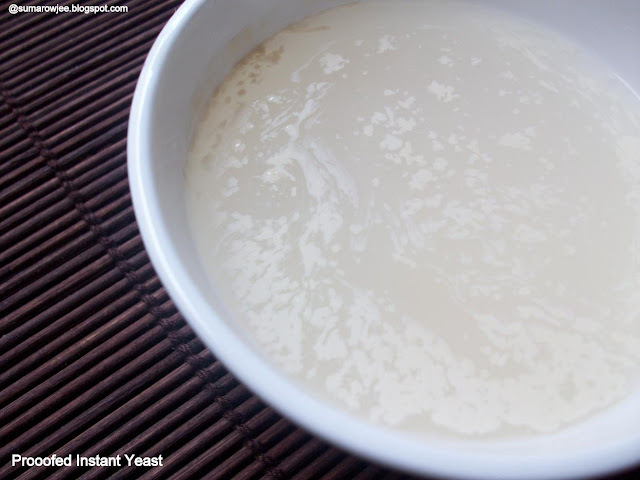 Using ADY and Instant yeast interchangeably : If a recipe mentions ADY, you can use instant yeast in its place safely. Then you can skip the proofing process and continue with the recipe. If a recipe calls for instant yeast (a recipe with warm water and sugar), then you can use ADY in its place, but you will need to proof it. In recipes which use cool water and no sugar you can't use active dried yeast here in place of instant yeast. More yeast in a dough : Ideally its 2 1/4 tsp yeast for 3 to 3 1/4 cups of flour. If you use a little more than this, the rise will be faster. But if you use way too much, the bread will smell yeasty and funny. If using yeast for baking in a bread machine, the amount of yeast varies. As in these potato rolls. If you use slightly less yeast, less, no harm, the rise will be a little slower. Slow rise breads are more flavorful. But then you can't use too little as the amount of kneading and rise time also affect gluten development. Play around only if you know what you are doing. 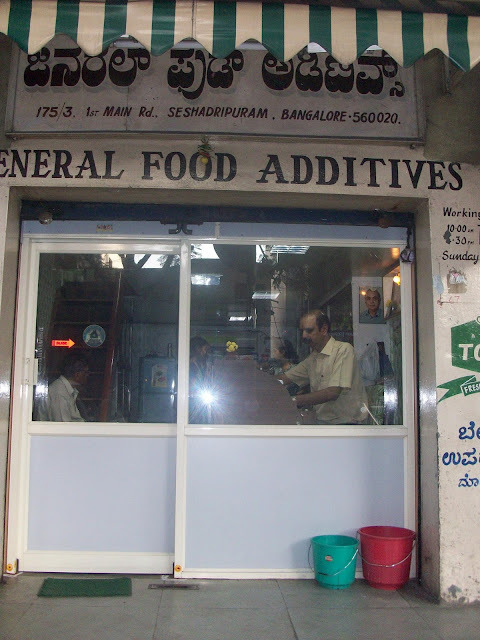 Sources in Bangalore: You can buy instant yeast from IBCA and General Food Additives, also check The Brown Tree, Godrej Natures Basket. 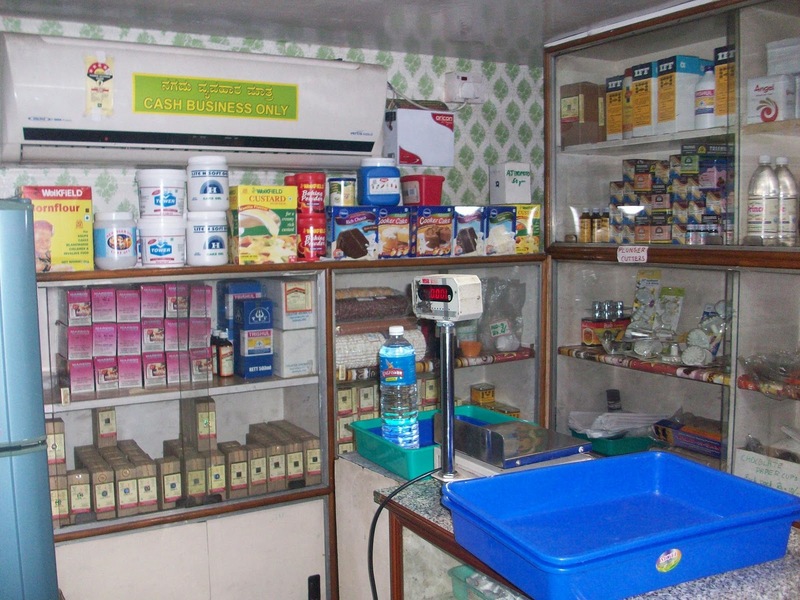 You could also check other whole sale shops which sell baking supplies. Most of them stock large packs of 500 grams. Gloripan, Angel and Eagle instant yeast (not Eagle active dried) have worked for me. Online sources : Zansaar, Bakersmart. World Bread Day is on 16th October. Shall we roll up our sleeves and start working with yeast? Disclaimer : This post is merely intended as information to identify good yeast and not with the intention of bashing a particular brand or a paid review for promoting another brand. 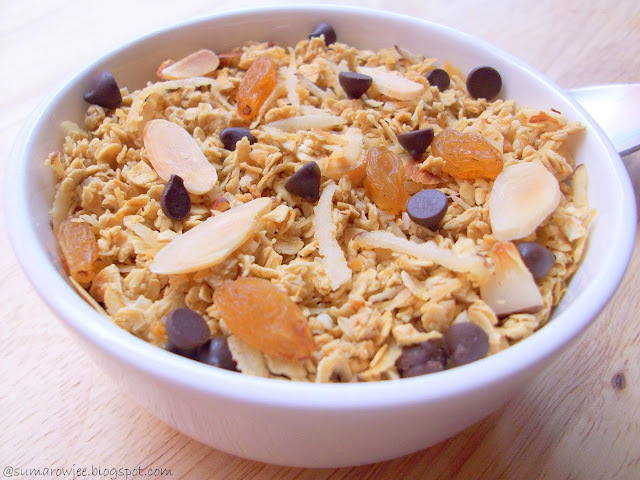 Granola is a popular choice of breakfast or snack for a lot of us. This mix of oats, nuts, honey, oil or butter, dried fruit and additional flavoring is baked in a moderate or slow oven till crunchy or chewy according to personal preference. A decade ago or so, this was relatively not so well known, at least for those of us in India. But now with increasing health consciousness and the need for pre-made breakfast in our busy lives, granola, muesli and other cereals have found their place on our breakfast tables. Honestly, we are not a love-granola-for-breakfast family, we prefer the more substantial old fashioned things for the first meal of the day. Granola is something we enjoy as a snack rather than a meal. I have to be honest again and tell you, strange though it may seem, I have not bought granola from the store, so obviously not tasted it. Not out of prejudice, let me assure you, it somehow never made to my shopping cart, may be because it did not sound tempting enough and too expensive for that box? But baking granola at home seemed like fun and I have baked granola a few times earlier, experimenting with varieties of oats and combinations of the ingredients. Somehow, though it was tasty and we (between me and my son, who eats it for dessert!) managed to polish it off quickly each time, I did not succeed in getting it crunchy - the biggest 'must' for me as a preference factor in granola. I tried baking with Quaker oats, the old fashioned rolled oats and even the jumbo breakfast oats. I have figured out that I like my granola baked with quick cooking oats, just about sweet, nutty and really crunchy. I don't enjoy eating granola with milk as much as do eating it as is, as I feel it takes away the crunch and leaves it a tad chewy, something I don't really relish. 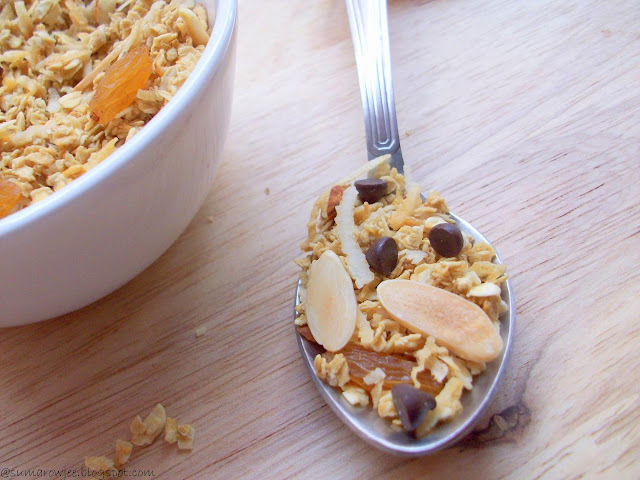 My humongous sweet tooth is no big secret and I love the way popping a spoon or two of the nutty, sweetish granola satisfies my sweet craving temporarily and without much guilt. 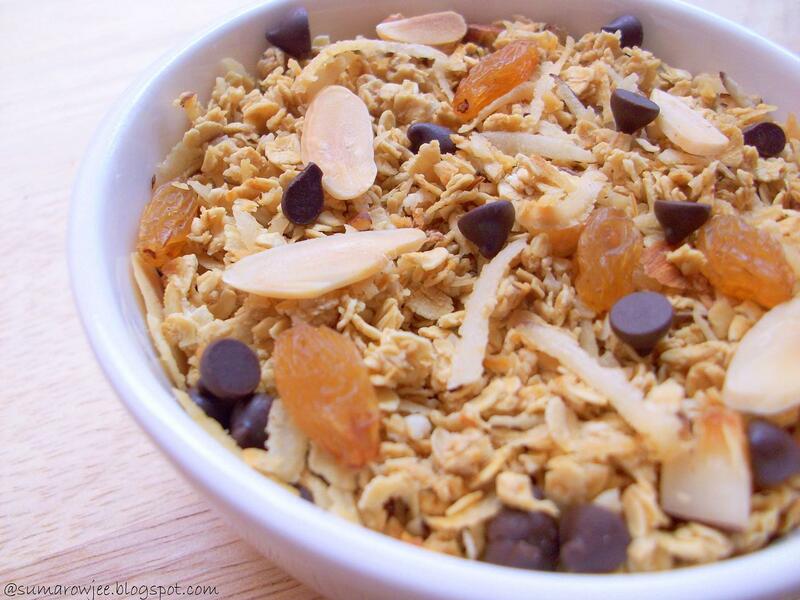 Baking granola is little effort, easy and less hands on time. I can add 'easy' to the adjectives as I now have a small stash of flaked almonds in my freezer. Since the only effort for us would be chopping or slicing almonds if using, if you can sacrifice that flaked almond bit for your pictures, you could just chop them roughly. My sister thankfully sent me some flaked almonds fearing I would cut my fingers a bit too much in my attempts to slice almonds. 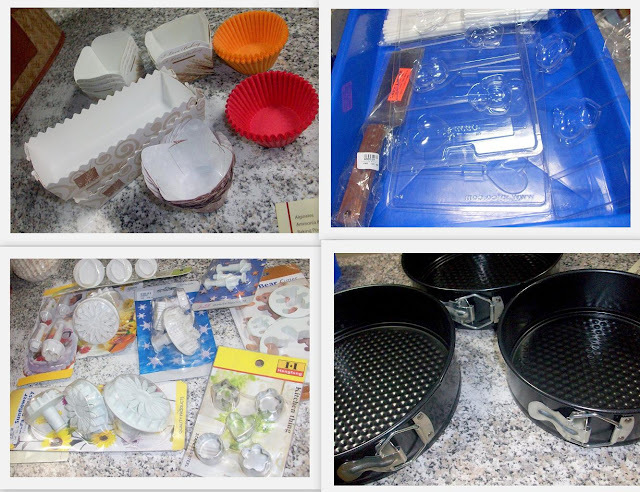 Thank you Sis, for making my baking life easier!! Moving on, we mix the dry ingredients and the wet, put them on your tray, bake for 45 minutes to an hour, stirring the mixture once in every 15-20 minutes to ensure it gets baked evenly and doesn't get burnt during the prolonged baking time. 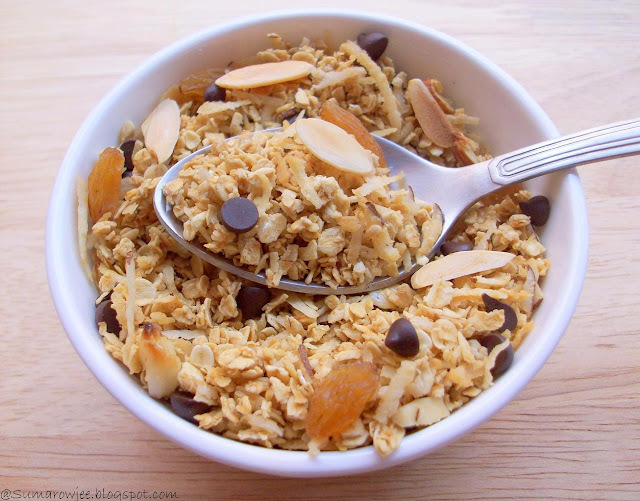 The best thing about home-made granola is you can play around with the ingredients and flavors, control the amount of sweetness and amount and kind of fat that goes into it, making it healthier and tastier, cost effective too. But while doing this, make sure you maintain the dry-wet ingredient ratio in the recipe you choose. I prefer baking the oats, nuts, coconut etc and then add the dry fruits later after baking. One way of adding the liquid ingredients is to just mix them together and then add to the dry. The method in this recipe is boiling together all the liquid ingredients and then adding adding to the dry, something I have not done earlier in my granola experiments. The Chocolate Granola on Deeba's PAB lured me into giving granola baking another try in my quest of crunchy granola and I am so so glad I tried this recipe. I got tasty, crunchy granola with some chocolate thrown in as well - just what I was looking for! As a bonus, as Deeba says, the high fiber content in the oats, the anti-oxidants in the nuts in combination with a topping of low fat milk to make it a wholesome and complete meal. I have done a minor bit of tweaking to the recipe, added some shredded coconut and saved the addition of the raisins to the end. I have halved the quantity in Deeba's recipe. Here is what I did. Method: Preheat the oven to 150 degrees C / 350 degrees F (read note below). Cover your baking tray or tin with parchment. I have used a 9'' round tin, baked half of the recipe in this pan and another half in my OTG . In a large bowl, combine the dry ingredients - the oats, coconut, almonds. Set the raisins and chocolate chips aside. In a small saucepan, combine the water, honey, sugar, oil or butter, salt and vanilla bean / vanilla extract. Bring to a simmer and let cook until the sugar is dissolved. Cool. Stir in the liquid to the dry ingredients. The mixture at this point feels very soft. Transfer the granola mixture to the baking sheet (make sure its in a single layer) and cook for 45 minutes, stirring with a wooden spoon every 15 minutes to make sure that the granola cooks evenly. Let cool completely. Transfer to a air-tight container and add the chocolate and raisins. Eat with chilled milk or yogurt. A note on the Baking time and temperature : I have baked this twice, the first time at 150 degrees. The mixture was beginning to brown too fast after 30 minutes (may be the layer was too thin? ), so I lowered the temperature to 140 degrees the last 15 minutes of baking. The next time, I baked at 120 degrees C and it was baked perfectly in 45 minutes again. Whatever temperature you bake at, be sure to stir the mixture every 15 minutes, be really careful after half an hour and check more frequently as the mixture will go from toasted to burnt really soon. If baking in a dark colored pan reduce the oven temperature by 10 degrees C. I shall be baking this again and shall post any updates here. I finally got my granola delicious as well as crunchy, thanks so much Deeba for this wonderful recipe!! Sending the granola to Smitha's Healthy Cooking Challenge, guest hosted by Priya, the theme is Healthy Bakes.